Ready to up your cooking game? 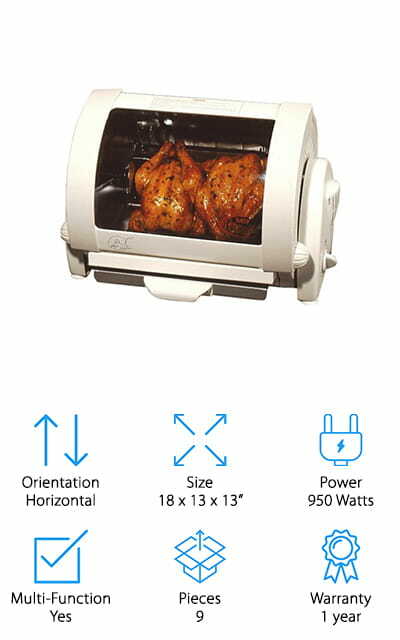 If you are then you definitely want to take a look at a rotisserie oven for your household. These ovens can really change the way you cook and they can give you plenty of new options for great meals. Of course, this rotisserie oven buying guide is going to help you figure out what’s available and hopefully, find the one you really want. Orientation: Does the oven stand up straight or does it lay down flat? You want something that will fit in the space you have and knowing which direction you need to stand it is an important factor for that. Size: What amount of space is the oven going to take up? Make sure you have enough space available so you can set it up on your counter, a table or anywhere else. If you get something too big or small it won’t work for you. Power: How many watts of power does it give you? You need something that has the ability to cook the meals that you want. If it doesn’t have enough power you’ll be spending a lot of time waiting for your meal to be done. Multi-Function: Can the oven itself do multiple things? Is it able to help you with different methods of cooking or does it only do one thing? This is going to be an optional aspect because maybe you want more and maybe you don’t. Pieces: How many pieces are included in the box? Do you get just the rotisserie oven? Is something else in there too? Does it come in pieces that need to be assembled? These are all things you want to be prepared for. Warranty: How long is the warranty? As with anything else, a longer warranty means that the company stands behind their product and believes that it’s going to work for you, the way that you want it to work. You may not have looked at rotisserie ovens a lot before, but there are plenty of them out there and there are definitely plenty of reasons that you should be looking. If you want to get something great and you want to make sure you have the best rotisserie oven for sale then these rotisserie oven reviews are going to be a great place for you to get yourself started on the right foot. 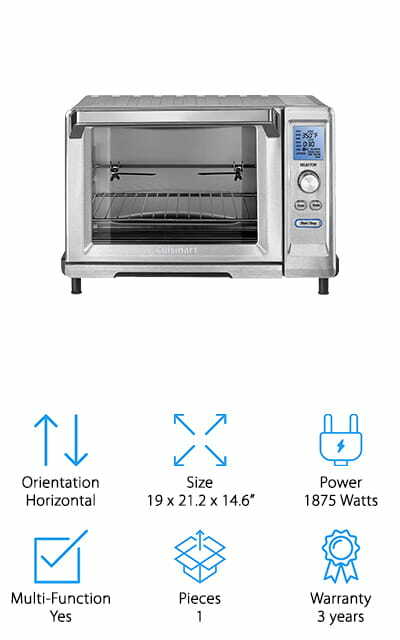 This convection rotisserie oven is also a standard toaster oven and comes in a sleek stainless steel that will look great on your counters. It has a 0.8 cubic foot capacity that can cook a 12” pizza or 6 slices of bread so you can get a great meal easily. There are 12 different cooking functions and it even has a digital control system, with a backlit display. 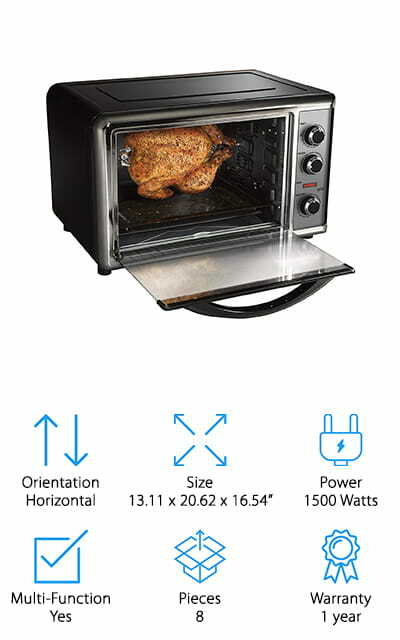 When it comes to using the rotisserie function you can even roast up to a 4 pound chicken. The heat sensor even provides you with precise oven temperature so you can feel confident that it’s heating right where you want. What you won’t have to worry about is moving the unit either, because it’s light enough to put it anywhere you want and store it away when you’re done. When it comes to cleaning it’s entirely non-stick as well, which means it’s simple to clean and our best rotisserie oven. This sleek and stylish best chicken rotisserie oven has plenty of features including a grill and griddle in the top. 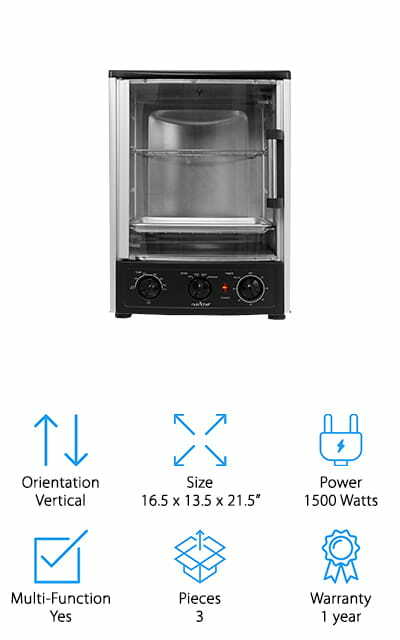 It can be used to bake, broil, toast, steam and grill and even has a heat selector function switch to make setting everything up a whole lot easier and faster. It has a 23 liter capacity and has enough depth that you can even cook a pizza. The extra-large capacity means that it can hold up to 6 pieces of bread at the same time. With adjustable temperature controls that let you go from 150 degrees up to 450 degrees. You even get a 60 minute timer control with an automatic shutoff. 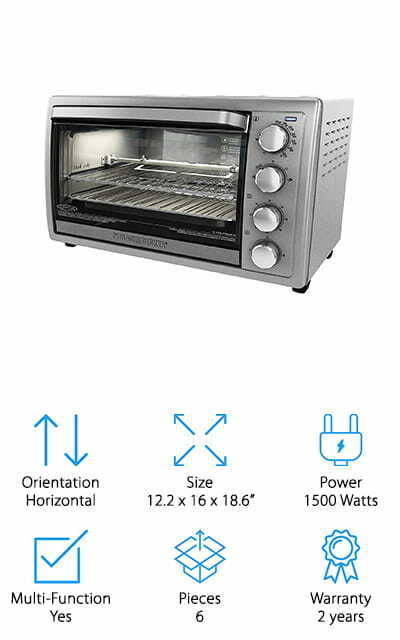 The system has 1500 watts of power and even comes with an oven top dome lid, wire grill rack, pan removal handle clip, crumb tray, rotisserie removal tongs and a whole lot more. This chicken rotisserie oven is a vertical design, which means it’s great for those who have less counter space but plenty of height available. It can even make your turkey, bake, broil and a whole lot more. With 2 shelves and adjustable settings, it has 1500 watts of power to get you a great result every time. You’ll get a range of different tools including a kebab skewer rack, bake pan and grill racks. It’s entirely stain resistant and it has a 1 year warranty that says it’s going to last for a long time. With high power heating elements and energy efficient capabilities, this oven has simple controls and you can open up the door easily to slide food in or take it back out. You’ll be ready to make that next meal in no time. 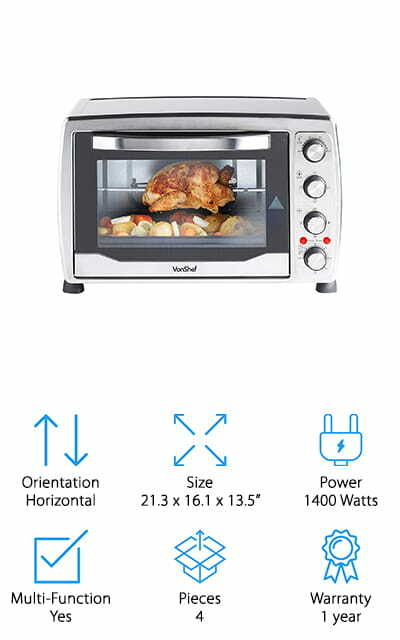 This convection rotisserie oven is designed to give you fast and even baking and more. 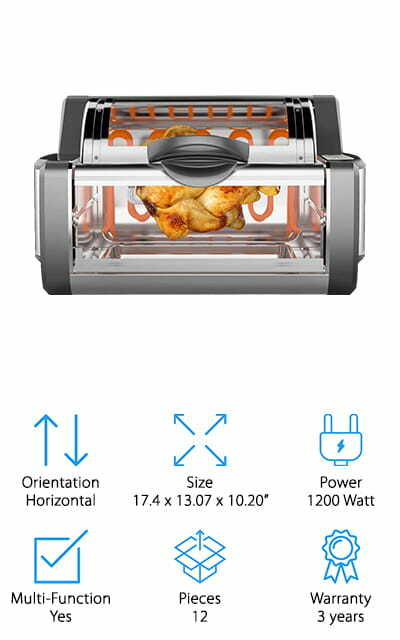 It has 5 different functions, including bake, broil, toast, keep warm and rotisserie. The size is large enough to cook a 12” pizza or 6 slices of bread but small enough that you can easily set it up on a standard kitchen cabinet. Not only that, but you have plenty of control for temperature, style of cooking, time cook and more. You get plenty of features so you can take on longer cooking tasks as well and the oven even shuts itself off when the timer goes off. Adjust the rack with different available positions and even use the different accessories to get more capabilities. There are 2 oven racks, a bake pan, rotisserie rod and fork ends, a rotisserie removal tool and instruction book and it’s definitely the best countertop oven. This rotisserie chicken cooker gives you plenty of space to cook a 5 pound chicken, 2 12” pizzas or even 2 9” x 13” casserole dishes. That means you can make a great meal in a short amount of time. Not only that but you get plenty of cooking features that include bake and broil as well as the rotisserie. You can get a more even and faster cooking process through the convection oven than a standard oven and you get a removable drip tray, rotisserie skewer and lifter, 2 oven racks, a broiler rack and 2 baking pans to go with the oven. The horizontal design means that you need a little bit of counter space in order to set up the system, but then you can easily store it away when you’re not using it because it’s lightweight and easy to move. You get to set up everything you need with easy knobs as well. This rotisserie oven is designed to pressurize and moisture seal everything so you can get highly concentrated flavors out of anything. 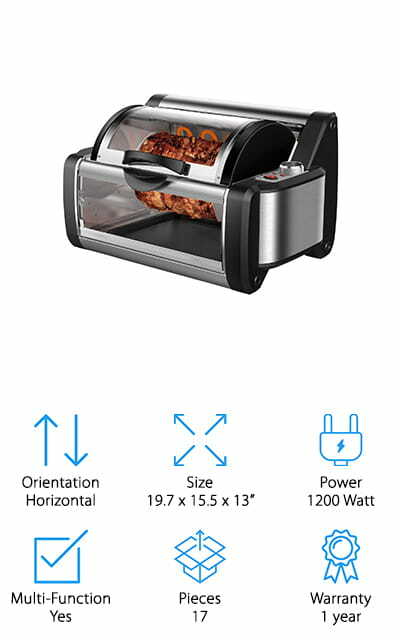 Able to cook up to 70% faster, this rotisserie actually has 6 different functions, including the ability to bake, roast, broil, toast and warm. Moderately sized, it actually opens to the side rather than down, making it easier to get your food in and out safely. You’ll also have easy to use knobs to get the right settings and enough space for a 14 pound turkey. You’ll get everything you need to use the oven including rotisserie tools and accessories, a roasting pan, drip and bake pan, crumb tray, broil rack and even a recipe booklet. That means you’ll be able to get started even if you’ve never used a rotisserie before. The unique design of this rotisserie oven makes it a great way to save a bit of space and still get the rotisserie features that you’re looking for. It’s made with stainless steel and tempered glass and includes a kabob rack and skewers so you can roast a turkey or make your favorite kabobs. The heating elements are high power and they improve energy efficiency and cooking time. Simple to clean, there’s even a grease drip tray in the bottom to make it easier. 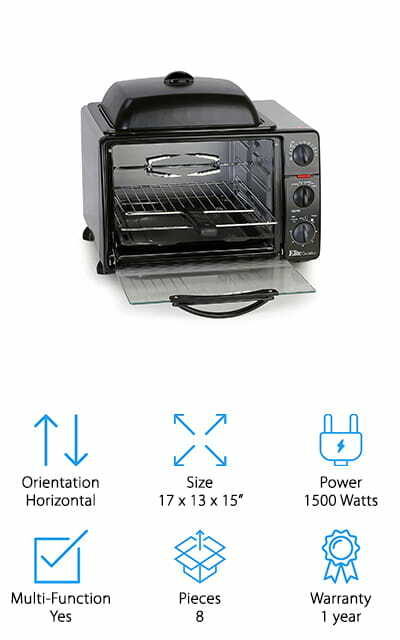 With 1200 Watts of power, this 120 volt oven is lightweight so you can move it around whenever you need. You’ll even get a grill rack and a food basket to make sure you can get a range of different foods from this system. This moderately priced oven has a rounded center to provide the perfect way of cooking your foot on the rotisserie. It even comes with 7 kabob skewers to help round out your meal and a pair of heat resistant gloves to keep you safe. The unique design helps you cook anything you want and the adjustable heating element ensures you get the heat right where it needs to be. There’s a simple control panel and a safety switch to protect those around you. You even have a timer and lights that let you know whether the system is on rotisserie or grill mode. That way, you know where the heat is and you never have to worry about setting it to the wrong heating cycle. What could you cook in a 36 liter convection oven? A whole lot of things and this one definitely won't disappoint. 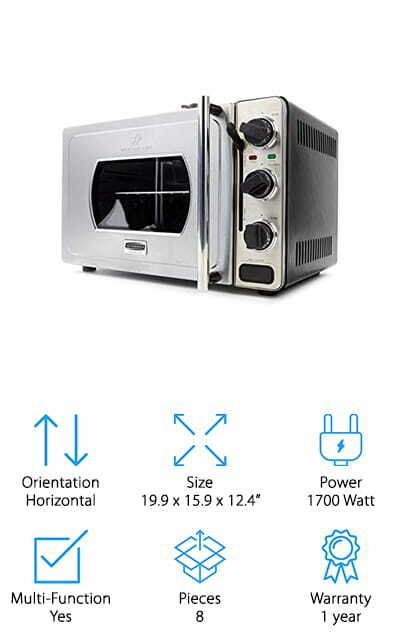 It’s priced low, making sure it’s in the price range for most users and it can act as a convection oven, a rotisserie, a grill and even a toaster oven. You’ll even be able to use it for baking with the included baking tray and wire rack. The 6 total cooking functions and the fact that it can cook up to 60 minutes at a time and heat to 450 degrees means that it’s going to really get the right results. If you’re looking for something to make meals in at home or even to take to work with you for that next party or take camping this is a great way to go about it. You’ll be able to count on the 1400 watts of power available. Finally, we have a slightly different design for a rotisserie oven with one that is completely cylindrical. This one lets the meat baste in the juice that comes out of it and can roast up to a 5 pound chicken with no problem. There’s even a 3 hour countdown timer that has a bell and an automatic shutoff. That means you can set it and forget it until your meal is ready. There’s also a handle tool that helps you easily remove your foot and a flat basket and kabob skewers to help you get some variety. Made by a company that’s known for kitchen gadgets and cooking, this George Foreman rotisserie is definitely something you’ll want to look at closer. It’s made to secure to your counter with suction cup feet and even has a 1 year warranty.